The Kerrie Show: How Catholic Are You? Make Your Own Quiz! 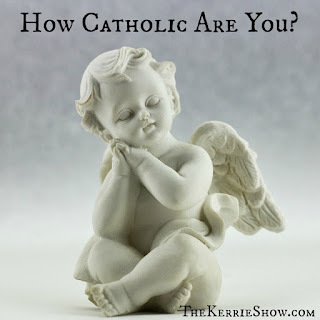 How Catholic Are You? Make Your Own Quiz! So it seems I’m too Catholic for most Protestants; not Catholic enough for most Catholics; and pretty okay for most agnostics. How did I come to this conclusion? Well, I’ve pondered it for a long time, and it seems to come down to percentages. -5% Have you attended Mass every weekend and obligation day for 7 years but missed 4 Sundays for travel and vacation reasons? -25% Have you listened to “I Kissed a Girl” and liked it? -10% Do you love rock and dance music? +15% Do you practice NFP? Do you even know what I'm talking about? +10% Do you have more than 2 kids? Bonus points if you go over 5 kids. -15% Do you love cuss words? +20% Do you use a Catholic homeschool curriculum? -5% Did you ever let your oldest son go to a Nazarene church with his friend on Wednesday nights? -5% Do you dig Halloween? -20% Subtract if you didn't give anything up for Lent last Easter. -5% Like mine, do your kids have “secular, worldly” friends (like when they grow up they’re only gonna hang out with other Catholics)? Well, I am at about 75% Catholic. So I am "better" than those in the 50% range and "worse" than the 90-100% people. I need to stick with people in the 70-80% range of Catholicism for the best bet at a real friendship. Do you see how complicated we make religion?! I’ll work on this, too. Peace out. *Originally posted 9/6/2008 and now we do virtual school through Kansas so take my points away on the Catholic homeschool curriculum thing but add like +1,000% since I now teach religious education and we go to Catholic co-op once a week! Woo hoo! Do you sleep around while preaching at your friends that they will go to purgatory unless they get their butts to Confession? Do you do volunteer work ... and not tell the world about it and post it on Instagram? Have you met the Pope?